Sometimes timing in international politics can be really bad – at least this is what those dealing with the Afghan withdrawal plans at the Pentagon must be feeling at this point. After much uncertainty, the zero option for Afghanistan – a complete withdrawal by the end of the year – is being taken seriously. The White House and the Pentagon both see it as a viable endgame situation should the Bilateral Security Agreement remain in eternal limbo. Unfortunately, with recent developments in Ukraine, executing on the zero option might get significantly more expensive for the United States. The key to pulling off a successful and manageable withdrawal is the Northern Distribution Network – a route established in 2008 to get supplies in and out of Afghanistan while bypassing the risky (but cheaper) Pakistan-based routes entirely. Unfortunately, despite its massive defense R&D spending, the U.S. never quite figured out a way to teleport its equipment in and out of landlocked war zones. The original Pakistan-based routes provided a quick, sea-based route into Afghanistan, over the Durand line. As the situation on the Afghan-Pakistan border destabilized, it became apparent that approaching Afghanistan via the northern frontier was preferable. In this route, equipment came to Afghanistan from sea, docking first in the Baltic, then on the Georgian and Turkish shores of the Black Sea, and eventually transiting via land to Afghanistan. For the equipment that entered the Eurasian landmass via the Baltic, there was no way around Russia. And it is likely that when American hardware leaves Afghanistan, it will do so via the Northern Distribution Network. There is also an eastern extension of the network that traverses Kazakhstan and eventually ends up in Vladivostok, on the Russian Pacific Coast. Now what does this have to do with Ukraine? Russia’s acquiescence to the network isn’t a no-strings attached proposition though. The Kremlin rakes in around $1 billion a year for allowing the transit of supplies via its land routes. For Putin, the benefits of maintaining a pro-Russian Crimean peninsula certainly outweigh the potential lost revenue from the closure of the Northern Distribution Network. Additionally, surely when Russia agreed to permit the use of its supply routes for the Afghan war effort, it know that it had acquired a powerful card. Should the political situation between Putin and the U.S. and NATO continue to deteriorate, the U.S. road out of Afghanistan could get complicated. The U.S. would still find a way to get its hardware out of Afghanistan but at a massively increased cost. 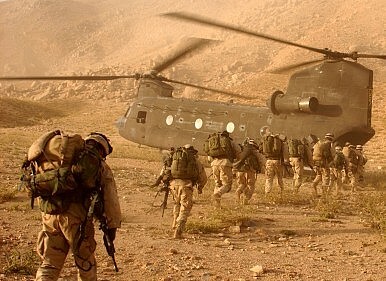 Airlifting heavy equipment out of Afghanistan would have massive fuel costs. The possibility of heading back south to Karachi is also on the minds of many at the Pentagon. One official notes that Karachi is still the “preferred method” of shipping everything out of Afghanistan. The problem is getting the equipment there and tolerating the risk of traversing the Afghanistan-Pakistan border. The situation sheds some light on just how significant of a strategic boon Russia’s geography can be. Putin may find himself isolated after his aggression in Crimea, but that doesn’t mean he can’t fight back elsewhere. Meet the Russian Politician Who Thinks That 'Tanks Don't Need Visas'Ukraine's Geopolitical Spillover Officially Makes it to AfghanistanRussia Threatens Nuclear Strikes Over CrimeaRussia Expands Naval Presence in CrimeaRussia’s Ukraine Invasion: An Opportunity for America?